Defence issues in the news today include cuts to the number of trained Army personnel, and an emergency COBR meeting convened to discuss the migrant situation in Calais. It is reported that the Army has already hit its 2020 manning target. This is not unexpected and while these numbers today show that recruitment is a challenge we are clear that our world class Army has enough people to meet all its commitments across the world. We have a growing economy and that means increased competition to recruit – including in key areas like engineering, and we have to rise to that long term challenge and we are taking significant steps to do that. The article suggests that we are replacing Regular personnel with Reserves; but we are clear that the expansion of the Reserves is not the case, but about doing Defence differently. It is not about doing Defence on the cheap; it is about changing the way we deliver Defence to make the best use of our resources and to harness the talents of wider UK society. Our Reserves are essential to our military capability – accessing skills and expertise all the time, providing greater mass in the short term and acting as a platform for expansion in the medium term. This government knows how important it is to invest in our Armed Forces and we have the biggest defence budget in Europe, the second biggest in NATO and we have committed to spending 2% of GDP on defence over the next decade to make sure we keep Britain safe. All of this sits within the clear plan we have – we call it our Army 2020 plan – for a modern, dynamic force that has the manpower, the skills and the structure to keep Britain safe and fulfil our role on the world stage. It is reported that an emergency COBR meeting has been convened to discuss the migrant situation in Calais, following calls from the Freight Transport Association for British troops to be deployed to guard terminals in northern France. It comes after 2,000 migrants tried to enter the Channel Tunnel on Monday night. Work has begun to rebuild a jetty at Portsmouth Naval Base to house the Royal Navy’s new 65,000-tonne aircraft carriers. Defence Infrastructure Organisation has awarded VolkerStevin a contract to reconstruct Middle Slip Jetty so it can accommodate HMS Queen Elizabeth and HMS Prince of Wales – the biggest ships ever built for the Royal Navy. The Queen Elizabeth Class Aircraft Carriers are the largest ships ever commissioned for the Royal Navy. But it is not just the ships themselves that are a testament to the best of British engineering and technology. The vital infrastructure investment in the Naval Base, including the refurbishment and strengthening of the jetty, will ensure that Portsmouth continues in its proud maritime traditions and is the home of the carriers for decades to come. The Times reports that security experts are concerned by the idea of a drone carrying explosives or radioactive material being detonated over a crowded area, or even Downing Street. Although terrorists have yet to deploy one as a bomb, it is reported that military and technology companies are racing to develop devices to detect, track, disrupt or destroy rogue civilian unmanned aerial vehicles. There is further widespread coverage of the situation in Turkey, reporting calls from the country’s European allies for them to show restraint in its assault on Kurdish separatists. This came as the same allies gave public backing, through yesterday’s emergency Nato meeting, for Ankara in its battle against ISIL. The Telegraph says there are concerns that Turkey’s war against the Kurds shows signs of slipping out of control with the potential to damage the US-led coalition's fight against ISIL. Most of this morning’s newspapers cover the death sentence issued to Saif al-Islam Gaddafi, the son of ousted leader Muammar Gaddafi, for war crimes. Work to rebuild a jetty at Portsmouth Naval Base to house the Royal Navys new 65,000-tonne aircraft carriers is underway. VolkerStevin has been awarded a contract to reconstruct Middle Slip Jetty so it can accommodate HMS Queen Elizabeth and HMS Prince of Wales  the biggest ships ever built for the Royal Navy. 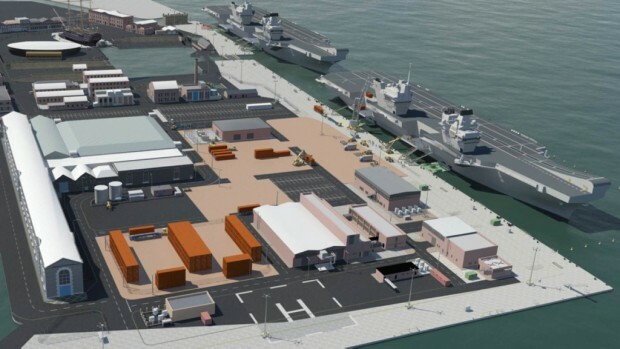 The work, expected to be completed in autumn 2016, forms part of a £100m infrastructure package to prepare the base for the arrival of the first carrier.